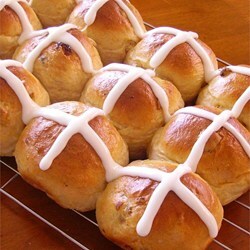 In England, hot cross buns are traditionally eaten on Good Friday; they are marked on top with a cross, wither cut in the dough or composed of strips of pastry. This updated version has a delicious frosting cross. To make crosses: mix together confectioners' sugar, vanilla, and milk. Brush an X on each cooled bun.